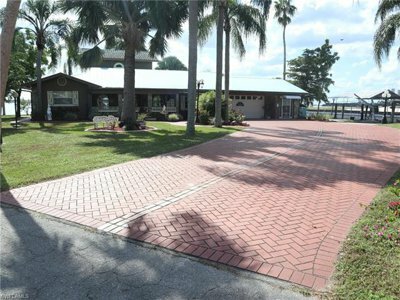 Better to List SW Florida Home in December or January? We get this question a lot? Is it better to list SW Florida home in December or January? The perception is there are more buyers here in season, so why not wait until season when more buyers are here, and the home will be fresher to the market. The advice we’re about to give might fly in the face of reason, however it is steeped in experience and logic. Yes, more visitors arrive in SW Florida in the seasonal months of January through April. If you look at the closed sales chart, you’ll notice we typically have far more closings in December than we do in January. Many buyers wish to get their sale in by year end for tax and homestead purposes. It’s not uncommon for us to have a big sales month in December, probably for these reasons. If we recognize that December can be a good month for sales, we must also recognize what happens each January and February. The listings shoot through the roof. 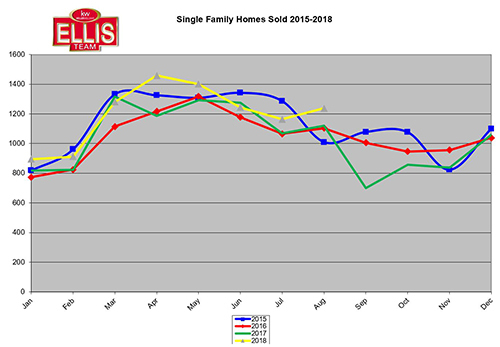 January and February show the largest increase in listing inventory each year. It will happen again this upcoming season. As a seller, if you’re contemplating selling in the next few months, you are absolutely better off listing now. Buyers are out there. Our team has been busy showing properties to multiple buyers, and we have several offers in the works. We tell sellers there may not be as many showings in December, but they showings that do occur tend to be from serious home buyers. If the middle of November is any indication, showings this December might increase over previous years. If sales activity is higher in December than January, and if there is far more listing competition in January, why would you wait to put your home on the market? Statistically you’re better off putting it on the market now. The answer is, sellers believe the holidays are a bad time to sell a home. And the reality is, many agents believe it to, so they take the month of December off. When they take the month off, it further confirms to them that nobody buys in December because they had no sales. The same can be said for agents who take the summers off. They believe there are no sales in the summer, and their belief becomes their reality. As you can tell from the chart, summertime closings are some of the best months each year. Why would you take those months off? But then again, why would you hire a part-time Realtor? To me, a part-time Realtor isn’t just an agent who has a primary job somewhere else and works real estate on the side. A part-time Realtor can also be an agent that takes months off. When you do that, you basically shut your business down. It’s one thing to take a vacation. Everybody needs them. For heaven’s sake, if you’re going to take a vacation, get another agent to cover for you. How would you like to be a seller and find out your agent took the month off? That’s why having a team makes a lot of sense. If any team member takes a vacation, the rest of the team picks up the slack. The Ellis Team works 365 days per year, and yet not every agent on the team has to. We want each of our team members to take some time off and come back refreshed. It’s all part of offering 1st class service. Agents around the office often ask us how the Ellis Team sells so much real estate each month. The answer is, it’s marketing. It’s not about the dollars you spend each month, although we do spend more on advertising than just about anybody out there. It’s about spending smart, understanding how and where to find your customers, and converting. The Ellis Team smashes industry standard online advertising conversion rates. The industry standard for online display ads back in 2016 was .35%. Many say it’s below that now. 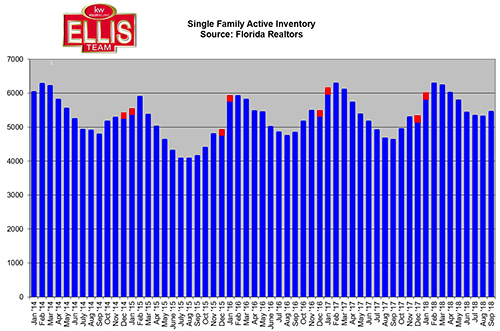 The Ellis Team converts 26 times that rate with an average in October at 9.13%. Some of our ads convert at 20%. The industry standard for a search ad is 1.91%. Again, the Ellis Team smashes industry standard online advertising conversion rates in every category. So how do we do this? We’re not going to divulge that but suffice it to say we know a thing or two about online advertising, and it works. In fact, the Ellis Team was the first team in the country to put the MLS on our website. That first year we sold over 100 homes, and Realtors everywhere wondered what was going on. NAR (National Association of Realtors) called us to Chicago to talk about this. They said the info was in the MLS books and couldn’t be made public to everyone on our website. After meeting with the president of NAR and NAR general counsel, they realized what we were doing was legal and met the bylaws of NAR. And this is how VOW (Virtual Office Websites) was born. SW Florida, you received it first. It later transitioned to IDX (Internet Data Exchange) and now Realtors across the country, along with Realtor.com, Zillow, and others are displaying agent’s listing data. I was always against Realtors letting 3rd party companies display our data. I felt it should be reserved for agents displaying each other’s data, but somebody up at NAR decided otherwise. Since those early days, we’ve been perfecting the art of online registrations and conversions. First, you must give people what they want. Your website must be fast, easy to use, and provide the most accurate and up to date data out there. Our website is real-time, so it’s fast, has all the listings including sold data, and it’s easy to use. Consumers like that they can see a photo gallery of all pictures instead of clicking one by one. Buyers and sellers like that they can get neighborhood data in real-time and emailed to them weekly or monthly. This informs them of new listings, pending sales, and closed sales in a community. This is helpful when you’re keeping an eye on one or more communities. Secondly, it helps to target the correct people. This is where the magic happens. It does no good to target the universe, because the universe will not all buy property, and certainly not in SW Florida. We target people who have an interest in SW Florida, even if they live out of the country. We find them from anywhere, and everywhere. 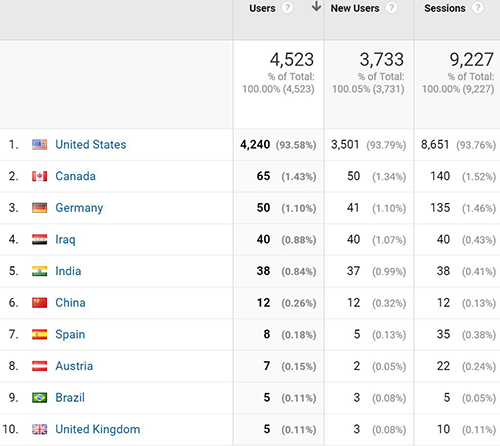 In the last month, www.LeeCountyOnline.com received 291 users from overseas. Our agents are working with several of them, and some are in a nice price point. Let’s not forget that we received 4,240 users last month from inside the US. And of those users, 82.5% are new users, so we’re advertising to and attracting thousands of new users each month. It’s no wonder why Ellis Team at Keller Williams Realty agents are so busy and selling so much. We know how to find the buyers, no matter where they are. Have you read the headlines lately? Home sales are sliding nationwide. September home sales fell 4.1% nationwide, and we hear new home construction has fallen too. What’s to blame for this? Home affordability. Rising rates are cutting into home buyers’ ability to pay ever increasing prices, and it’s showing up at the closing table. Rates have risen about 1% in the past year. Some experts warn of shifting nationwide real estate market upcoming. 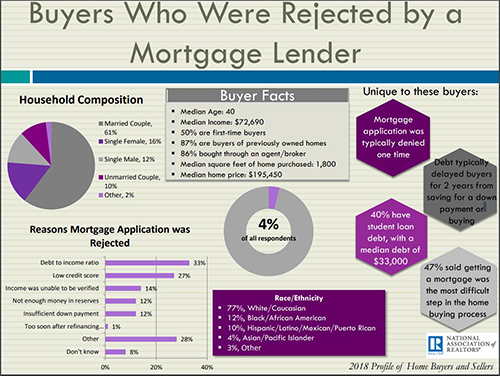 We know that a 1% rise in interest rates erases about 11% of buyer’s purchasing power. So if a buyer could afford a $250,000 home last year, that same buyer can now only afford $222,500 unless they received a pay raise since last year. Nationwide wages are growing while unemployment is falling, so there is room for further gains, but that takes time. Higher rates are here now. Locally in SW Florida, we may be in good shape. If you look at the chart, you’ll notice that SW Florida hasn’t participated in a price run-up the past two years like the rest of the state has. Prices in September are down. The median price in September was down 3.9% while the average price was down 3.5%. Remember, closing last year was disrupted due to Hurricane Irma, so we can’t read too much into this just yet. We don’t know if the lower or higher end were disrupted, so these numbers could potentially level out in coming months. We know active inventory is up 18% over last year. Again, many listings came off the market after Irma, so that’s not a surprise. Inventory has been building a bit in 2018, but so have the closed sales. In fact, 2018 is shaping up to be a very good year for home sales. We have the highest YTD home sales of any year since 2015. Is SW Florida in a Shifting Market? Not right now. Technically we’re still in a seller’s market, but it is getting very close to a balanced market. The thing that may be protecting SW Florida versus the rest of the country is the fact that we didn’t go up in value the past 2 years. The median price of a home in January 2017 was $245,000. Today, it’s $245,000. The average price of a home was $340,604 in January 2017. Today it’s $313,102. Could our market shift? Absolutely. No market stays the same forever. Agents who have been in the business less than 5 years probably don’t know how to handle a shifting market. The way you sell in a rising market is completely different than in a declining market. An experienced agent can sell in an up, down, or sideways market. Today, all indications are we’ve got a pretty good market, and there’s no reason to believe that will change drastically one way or the other. It always pays to study the market. We have a Market Report section on our website, so buyers and sellers can study the active, pending, and sold listings in a neighborhood as well as view all the photos. No other site has the sold data for you like this. It’s updated instantly, so when a home goes pending or sells in your neighborhood, you’ll see it live. You can create your own neighborhood report if you don’t see yours listed. Simply go to www.LeeCountyOnline.com to view your neighborhood. If you want a quick and Free home price analysis, go to www.SWFLhomevalues.com In less than a minute you’ll have your home’s value. If you’re thinking of selling, please call Sande or Brett Ellis 239-489-4042 Ext 4. We’ll be happy to answer your questions, show you how much you’ll net at closing, and about how long it will take to sell your home. Posted in Cape Coral, Cape Coral Real Estate, Fort Myers Beach, Fort Myers Real Estate, Southwest Florida Real Estate. A few weeks ago, we wrote about how strong closings have been in 2018. This week we’ll talk about two more indicators that help us evaluate the health of the market; median time to contract and dollar volume. Currently median time to contract date 63 days this year. The median time to contract is 63 days this year. This is measured by taking the number of days from listing to time of pending contract. In other words, it’s taking just over 2 months for homes to go under contract. If you have a home on the market and it’s taking longer than that, it’s either not being marketed correctly, it’s overpriced, or both. 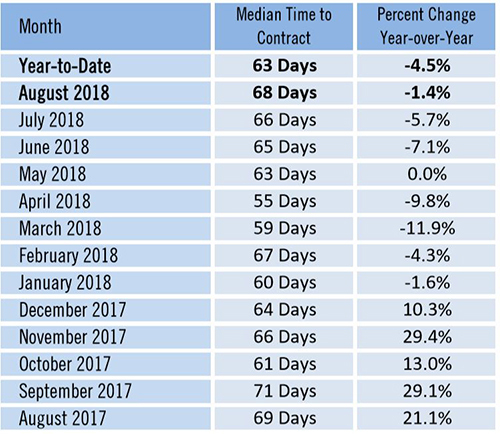 Because the market has been strong in 2018, the median time to contract is down 4.5%. It’s taking less time to sell homes this year than last. In the past month or two we’ve seen listings increase, and yet the market has gobbled up many of these listings. This tells us buyers are out there and ready to buy, but at the right price. Even in a hot seller’s markets some sellers seem to overshoot the market. Ask all those sellers in 2005 and 2006 who were on the market and failed to sell if they’d love to have that opportunity back. Some sellers will always be too greedy for the market. There’s a term for them. They’re called Expireds because they were never priced to sell at the market. It might not be their fault. If they demanded more than the market would bear, it is. Perhaps they listened to their agent who didn’t really know that market, or really needed a listing badly and convinced the seller they could sell it higher than any other agent. I guess you could say it’s the seller’s fault for listening to the wrong people, but how is a seller to know for sure? We see the same mistake from buyers. They low-ball sellers and seem to come up short on every offer. Their goal was to purchase a house, and yet they see everyone else buying but they can’t seem to score a deal. Greed is getting in their way, just as it does for sellers who overprice. Greed prevents more buyers and sellers from accomplishing their goals than anything, followed closely by fear. People have a fear of making a mistake, so often they do nothing. The sad reality is doing nothing may very well be the biggest mistake they could make. A seller riding the market down is no fun. A buyer watching interest rates rise while they sit on sidelines is no fun either. Getting back to the market, the other indicator we watch is dollar volume. Dollar volume is the cumulative total of all sales. It is of course influenced by the number of closings and the average price. 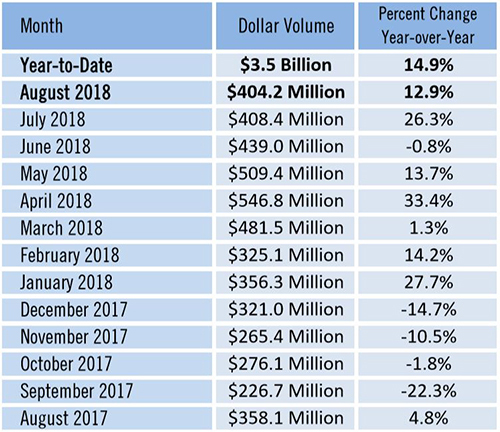 As you can see, dollar volume of sales was up 12.9% in August and up 14.9% year to date. By all accounts, 2018 has been a very good year for real estate sales. Waiting in this market can be a costly mistake, both on the buy side and the sale side. It pays to work with a professional that knows the numbers. 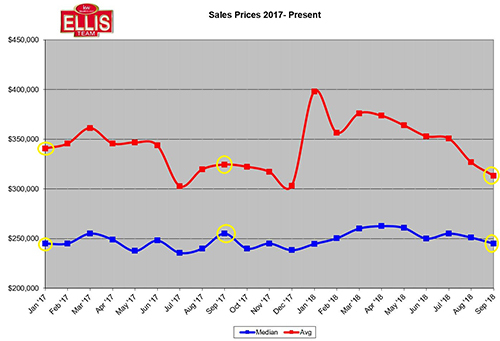 I can assure you, agents on the Ellis Team know the market numbers. If you’re looking to sell a home, call Sande or Brett Ellis at 239-489-4042 Ext 4. If you’re looking to buy, our team of friendly and knowledgeable agents can help you too. Don’t forget to check out www.LeeCountyOnline.com It has all the listings, and it’s updated instantly, so you’ll know about hot new listings before other buyers and sellers on those other sites. Sometimes they take days to update, and sometimes listings are missing because the agent decides not to list them there. We have all the listings. You can even find out what your homes is worth online too. Always call the Ellis Team at Keller Williams Realty 239-489-4042. We’ll take good care of you, and give you the straight scoop with what’s really going on in the market! The last few weeks we’ve been reporting official Southwest Florida real estate sales numbers, and the numbers look good. This flies in the face of what some sellers and some agents are saying about the market. Real estate tends to be an emotional item. It is for buyer and seller, and for agents alike. This week we’ll focus on why you should avoid Dr do it all when selecting a Realtor to sell your home. Buyers and sellers tend to get caught up in their own personal transaction. Agents tend to get caught up in their overall production. Sometimes agents confuse their own production with that of the overall market, and often they are completely different. The typical agent’s production cycle is up and down. They prospect, farm, and lead generate which leads to appointments. As they take appointments they get busy. A lot goes into working with a buyer or bringing a listing to the market. Both can be time consuming. As transactions begin to occur, all of the prospecting, farming, and lead generating tends to stop. They must focus limited resources on the ultimate goal, getting the deals closed. Once they get their deals closed, they’re basically out of business and must begin the process all over again. And after they do, the cycle begins anew. When agents are in the transaction phase, they feel like the market is booming, because they’re busy and they have closings coming up. When they are in the prospecting phase, they can feel like the market is dead and nobody wants to buy. Because they honestly feel this way, agents tend to report on how they feel the market is doing by how their personal business is going. And the answer always lies in which step of the process they are in. Talk to 10 different agents and you might get 10 different answers, and it’s all real to them. Experienced agents with a long track record of sales have learned to level out the ups and down by doing two things. Hire talent to help handle all the fine details of bringing a listing to market and managing a transaction. This helps agents do the 2nd thing, which is never stop lead generating. Not only will it help an agent level out the ups and downs of their business, it also helps their sellers. Imagine listing with an agent that is so busy taking your listing and closing a few deals that they stop lead generating. Now that your home is new to the market, there are no new leads for your home because the agent stopped lead generating to get your home ready for MLS. A lot goes into placing a home in MLS, if done properly. Professional photos must be taken. Several hours are spent on a pricing strategy, and several more hours are spent gathering information for the MLS, like HOA or condo information, and of course listing all the details and fields for the home. Then there is the dreaded agent remark section where agents must cleverly write a compelling story on why your home is a good buy. It’s no wonder why single agents get frustrated, because there is so much to do, and when business starts happening, the lead generation stops. This is where sellers get frustrated. Their home is fresh on the market, and few people are viewing the home. 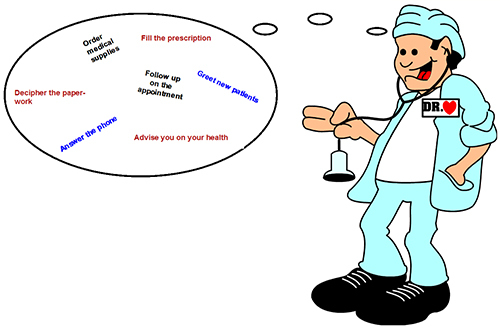 Avoid Dr Do it All- This is why we created a team. In fact, we were the first team in SW Florida many years ago. We never stop lead generating. The Ellis Team has a full-time listing manager to help with all the details of bringing a home to market. We have a closing manager to help get our deals to the closing table, so we don’t have to start all over with another buyer. And, we have a full-time marketing manager to make our ads, and our homes look good. We never stop marketing and lead generating. This is why our homes sell faster and for more money than the average agent. We have a list of buyers ready to buy now, and we are working every day to find them homes. We may already have a buyer for your home, and if not, our marketing will create one. Call Brett or Sande Ellis 239-489-4042 Ext 4 if you’re thinking of selling, or go to www.SWFLhomevalues.com to see what your home may be worth. SW Florida Real estate closings setting strong pace in 2018 and it’s the best kept secret out there. Perhaps people are caught-up in the headlines of red-tide and blue-green algae and just assume the market is suffering. I was just speaking with a lender this morning who mentioned she’s ready for real estate closings to start picking up. Lenders of course get a large chunk of their business through Realtors, so I asked her what her perception of the market was. In speaking with Realtors she works with, she had heard it was slow. If you look at the graph, you’ll see Lee County closings in 2018 are ahead of past year’s closings. In fact, we are 689 of last year and 211 ahead of 2015, the second highest year in this time frame. The data shows that real estate closings are not slow, and yet Realtors, lenders, and maybe even the public thinks it is. Your perception becomes your reality, and if you buy into a falsehood that the market is slow, suddenly your closings will be slow, which further confirms your suspicion that the market is indeed slow. When you buy into false facts, your outcome is determined by your attitude and assumptions rather than what could have been. If you simply change your thinking, you can change your world. 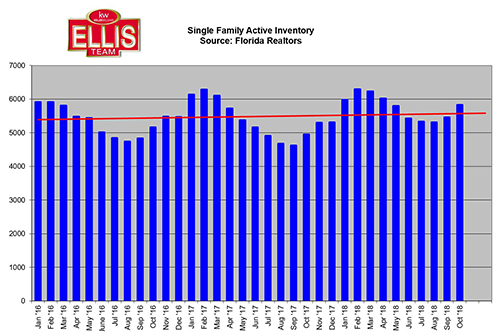 At Keller Williams we have a list or irrefutable laws, one of which is “Change the way you look at things and the things you look at change.” The SW Florida real estate market right now is a perfect example. This market can be whatever you want it to be. We have buyers looking to buy. We have a good economy, and rates are low historically speaking although on their way up. All favorable signs! And yet we have some negatives. Interest rates are rising, which is slowing buyer’s purchasing power. Sales are slowing nationwide. And of course, we have Red Tide and Blue Green Algae. There, I said it. We have positives on the table and we have negatives on the table. So, which is it? Every business should run a SWOT analysis. Strengths, weaknesses, opportunities, and threats. Every business will have positives and negatives. Every relationship will have both. Your outcome is dependent on how you look at things. Do you choose to see the opportunity, or do you choose to see the threat? Facts are facts, and they often get in the way of how we’d like to perceive a situation. The facts are, we’ve got a pretty good market right now. If you’re an agent, you could either decide on how you’re going to go get your unfair share of sales or sit back and complain that sales are slow. They’re not slow for everybody, only those that choose to buy into the negatives. If you’re a seller, you want an agent that knows how to market and sell in all kinds of weather. Three things are certain, markets go up, markets go down, and the weather is always changing. If your home has been on the market and failed to sell, perhaps you need a new approach. It failed to sell for one of two reasons. Either it was overpriced, or it wasn’t marketed properly. We’ve taken over listings that failed to sell and sold them at the same price, so it wasn’t the price. We’ve taken over other listings that were overpriced, made the proper adjustments, and added our marketing and they sold. Sometimes it’s both, the price and the marketing. There is no substitute for proper marketing. Failure to market properly will cause a home to sell at a lower price, or not at all. Even homes priced correctly sometimes don’t sell, and that’s lack of marketing. Call Brett or Sande Ellis 239-489-4042 Ext 4 and we’ll be happy to sit down and discuss both with you. Or, go to www.SWFLhomevalues.com and get a quick and Free estimate of your home’s value, then call us when you’re ready to sell. 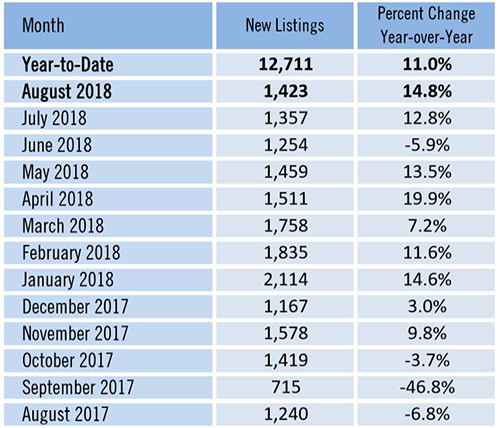 New real estate listings rose 14.8% in August and are up 11% year to date. 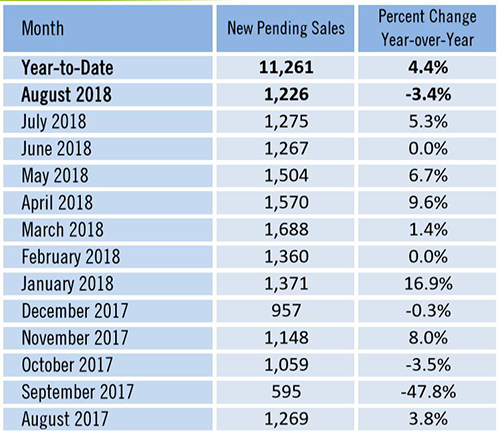 New pending sales were down 3.4% in August and up 4.4% year to date. Percentages can be misleading though, so let’s dive deeper into the numbers. 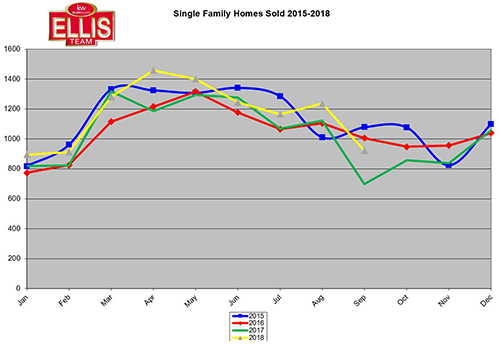 New listings in August totaled 1,423. This was up from 1,240 last year. In August 1,226 properties went pending. This means 203 more properties came on the market than went pending. The total inventory of active listings regardless of how long they’ve been on the market rose to 5,307. This is a 13.7% increase over last year, although it’s practically the same as the month previous. Our month’s supply of inventory rose to 4.9 months in August. This is the exact same as July, however it is an 11.4% increase over last year currently. So, what do these numbers tell us? Statistically we still have a seller’s market. Anything less than 5.5 months supply of inventory is considered a seller’s market. Median prices rose 4.6% over last year while average sales prices rose 2.3%. Prices are rising, although the rate of rise is leveling off. Nationwide the Case-Schiller Index was just released for July and it showed nationwide home prices rose 6%, which was smaller than previous gains. They speculate rising interest rates are beginning to tap the brakes on how much and how fast home prices can appreciate. Home sales slid .7% nationwide in July. Lee County home sales were up 9.1% back in July, and up 10.3% in August. While we’re all affected by rising interest rates, SW Florida might be a little insulated because we didn’t participate in the price run-ups the past few years like others did. Our prices were flatter the past few years, and only recently have begun to rise substantially. Going forward, buyers and sellers will need to do more research. Sellers looking for top dollar will need to interview agents in search of the best marketing plan. Anyone can sell a home in a rising market. Some Realtor’s say price sells homes. While we won’t argue with that, marketing does too. And that’s where some Realtors disagree. Advertising costs money and that eats into margins. Some agents can’t afford to market homes properly, so they don’t. They rely on the MLS and other agents to sell their listings. As inventory begins to grow, the need for marketing increases. You’ve got to find a way to make your client’s home stand out. As inventory rises, their home is just another in a long list of homes on the market. What makes it stand out? Once you determine that, you must tell the world. An agent can’t rely on MLS and real estate portals to do that. They are nothing more than a directory listing of homes on the market. Imagine searching through your neighborhood directory wonder which neighbor has the best home. A directory won’t tell you that. The MLS won’t sell your home, and neither will real estate portals. If you’re thinking of selling, you should call the Ellis Team at Keller Williams Realty. 239-489-4042 Ext 4. We’ll show you how advertising makes all the difference. Buyers today are doing more research too. As inventory rises, they have more to choose from, and more to learn. Buyers must be careful though, because although total listings are up, they may not be in your price range or the neighborhood you’re looking for. A good agent can help you sort through the maze of homes and educate you on the process. Buying or selling a home isn’t simple. You may not realize it until you run into trouble, and then it can be costly. Always call a professional. To get an idea of what your home is worth, you can at www.SWFLhomevalues.com It’s free and easy, and it’s pretty darn accurate most times. For a more detailed analysis, call Brett or Sande Ellis and we’ll come view your home and show you what we can sell it for, and how much money you’ll end up with in your pocket at closing. Call us if you need us 239-489-4042 Ext 4 and Happy Selling!